Thinking of Todd Gannon’s Reyner Banham and the Paradoxes of High Tech as simply an excellent biography of one of the 20th century’s most celebrated writers on architecture would be quite off base. It is simply too big and heavy (at nearly 5 pounds), too lavishly produced (by the Getty), and too all-encompassing in its scholarship to join ranks with its intellectual rivals. Banham was well known as the bearded, hard-driving scourge of the British establishment, sitting naked and guru-like in François Dallegret’s portrayal of a “standard-of-living package,” and lolling through Los Angeles’ four ecologies at the wheel of an open-topped muscle car in the ’60s. Banham was a provocateur with a pedigree—he’d been Nikolaus Pevsner’s protégé and a contributing editor at the prestigious Architectural Review. “Peter,” as he was known to friends James Stirling and Richard Rogers, came into his own as the champion of a wave of architects and artists who had grown up sharing the outlook of Look Back in Anger playwright John Osborne, and were eager to topple long-held architectural precepts. As such, Gannon’s book is an encyclopedic recounting of the growth of England’s architectural culture during Banham’s purview: its advocates, its internal debates, its flashes of brilliance, and its turbulent (though theoretically harnessed) explorations. If one wishes to understand the gestation of this important movement in modern architecture, there are more revelations, more “gotcha’s,” and more keen observations (with Gannon as guide) than one is likely to find in a decade-long subscription to Architectural Review. As a bonus, it’s even fun to read! Gannon has clearly mastered the art of serving up colorful prose without compromising either content or veracity, which is a welcome and indispensable attribute in this era of jargon and political introspection. In the book, Gannon highlights the conceptual bonds that united a band of rebellious architects and links their ideas to both the designs they produced and the philosophy they espoused, in order to create what may well be the definitive history of architecture in the age of Banham. 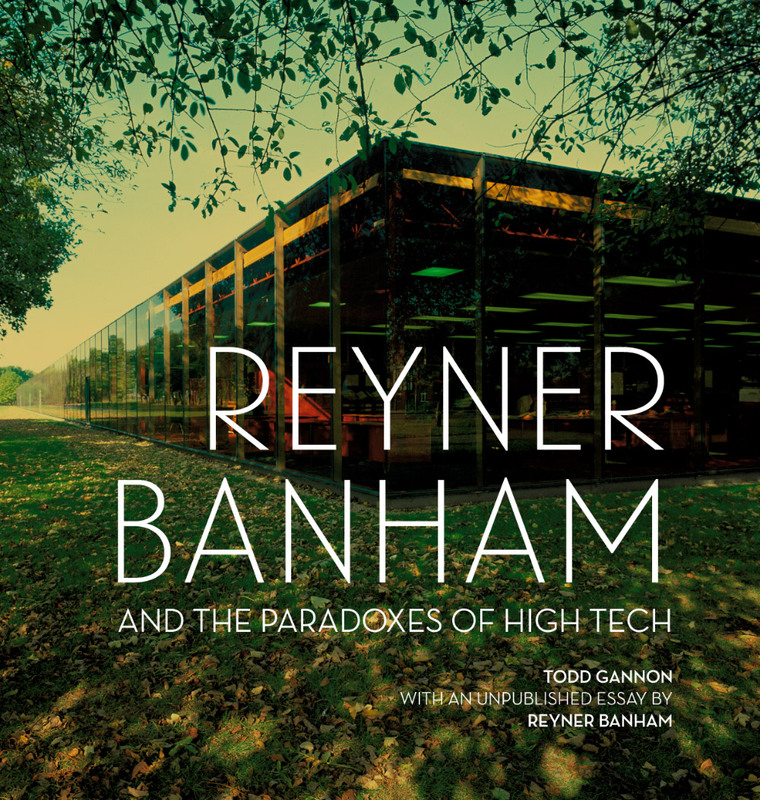 Loaded with original research and structured in apt and revealing chapters, Reyner Banham and the Paradoxes of High Tech delivers a convincing mix of anecdotes and informative images in a graphically rewarding format. Measured and precise, with a jaunty sense of discovery (you can almost see the high fives), Gannon’s text expands into detailed descriptions of the nooks and crannies of complex spaces such as those at Stirling’s Olivetti Training School in Haslemere. He then moves into a discussion of the social forces of England in the 1960s before displaying with appealing modesty the hundreds of sources girding his work. These are sentiments that seem particularly apt here in the U.S. 60 years later. Like The Devil in the White City, Erik Larson’s account of the Chicago World’s Fair and Louis Sullivan’s role in it, Gannon plunges the reader deep into the subculture that fed Banham’s thirst for a radical, nuts-and-bolts architecture. Thus, for Gannon, Banham seems more like an “inspiration” than a “topic.” Getting into his head—rather than tracing his long shadow and seeing things as Banham might have seen them—is a remarkable exercise in its own right. In this way, we see Gannon, the architect, viewing Banham as a lens rather than as a subject and leading us, his readers, through the thickets of his evolution. For Gannon, the signal preoccupations of his subject can be best understood as a linked series of insights, from The Architecture of the Well-tempered Environment to Los Angeles: The Architecture of Four Ecologies, which he decodes with forensic diagrams and text. What is remarkable is that the threads of Banham’s propositions can be spliced so invisibly into an expanded narrative that embraces contemporary as well as historic issues. It is humbling to circle back to Archigram’s city-building exercises, or to relish the newfound passion for a smart city, only to discover that Banham’s pioneering work had been there—and done that—50 years ago. That is why, for this architect, and I expect many more, Gannon’s work is far more than a trip down memory lane. It offers us a chance to renew our vows.